It's hard to believe that another new year is upon us. Does anyone else feel that the older we get, the faster time goes by? It's crazy. Thankfully, 2013 has been a great year of personal growth, fostering my new design business, cementing new friendships, and a few travel adventures. However, I always welcome a new year with open arms as it seems to be a beacon of hope with its promise of a new, clean slate. It's a great time for introspection, reflection, and goal setting. I'll get into all of that in a more personal post tomorrow about my goals and resolutions for 2014, but today, we get to dive into the fun stuff! Last year, I did a post called "Love it in 2013, Leave it in 2012" which everyone seemed to really enjoy, so we're doing a new version this year! What do I think will be big in 2014? You won't find anything too surprising here since my taste is mostly rooted in classic, timeless things. 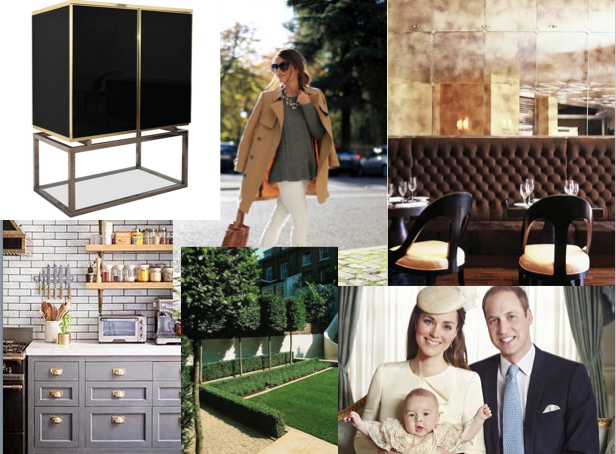 This year, I think you'll see pared down palettes of various neutrals mixed together in both interiors and fashion-- think camel, grey, and white or chocolate, black, and ivory. A touch of sparkle helps to ignite these combinations especially in the form of mixed metals. I also predict that you'll see sleek lines and glamorous pieces done in a very modern way-- think Maison Jansen mixed with Billy Cotton or Apparatus Studio chandeliers. On the home front, I predict that while furnishings will veer towards neutral palettes, cabinetry and millwork will enjoy a dose of rich, classic colors. Imagine grey, navy, and army green kitchen cabinets-- a departure from the white cabinets that have reigned supreme for the last ten years! Radiant Orchid may be Pantone's "Color of the Year", but I am not a fan of the color at all. I'd rather see various shades of green this year-- moss, emerald, olive, and kelly green. While on the topic of green, I predict that sleek, European-style gardens will gain in popularity stateside. Lastly, on the pop culture front, I hope that we'll see a lot more of Prince George and his lovely parents, the Duke and Duchess of Cambridge in 2014. As I mentioned in yesterday's "Currently Obsessed" post, I am newly addicted to Scandal and can't wait for the show to come back. It is SO good! I have quite a few things I'd like to see left behind in 2013! I am so over Kim Kardashian and Kanye West. They must be the two biggest egomaniacs on the planet, so they definitely deserve each other. I guess Kanye doesn't care that the fact that he considers himself God's gift to this green earth is incredibly arrogant, but seriously, why do people add fuel to the fire? Why on earth was he allowed to speak as an authority on design and architecture at Art Basel? I feel sorry for their poor baby. While I like some of Miley Cyrus' music, I am sick of her and her act. Yes, she is talented and is obviously a brilliant marketer, but she could have found other ways to push the envelope. I hate that young girls look up to her and emulate her. Miley, please leave the twerking and your ridiculous tongue in 2013! I also hope that the 90's, grunge-inspired style that has influenced fashion this past year is over with. Let's go back to pretty things, please! On the decor side, I don't care for radiant orchid one bit. I also hope that industrial-inspired pieces can be put to rest for a while. With the exception of some pendant lights, this is a style that has been done to death. I also think chevron needs to be retired for a while as it has appeared on just about every surface one could name. It's not that I dislike it, I'd just rather be given the opportunity to miss it. If you follow me on Instagram, you may have seen that I put out a call to hear from you on the topic of what to love in 2014 and what to leave in 2013. Here are a few of the things you guys can't seem to get enough of and want to see more of in 2014 along with the things you'd like to leave behind in 2013. A big thanks to everyone who participated! Nicole Gibbons of So Haute: I'm seeing a huge rise in popularity in marbleized prints and patterns as well as products in home decor made of natural stones such as marble, agate, amethyst and malachite. We saw a bit of this trend last year in higher end design and fashion but I think in 2014 we'll see much more of it in the mass market and it will be everywhere, which is great because I think that these kinds of stones and the patterns they create are so luxe and fabulous! What would I leave behind in 2013? Moroccan Rugs and Fiddle Leaf Fig Trees! This is a tough one because these are two things that I think are beautiful but I wouldn't miss seeing another fiddle leaf fig tree or a Beni Ourain style Moroccan rug! I think they will always have a place and somewhat of a timeless quality in home design but I have seen these two design elements used ad nauseum in the shelter magazines and on blogs so I think we need to give them a break! 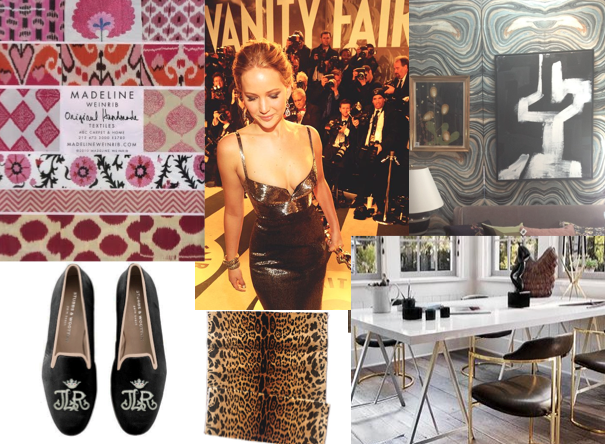 Mallory Shaw Design: Love...gold/brass, leopard, colorful ceilings, wallpaper, laid back luxury. 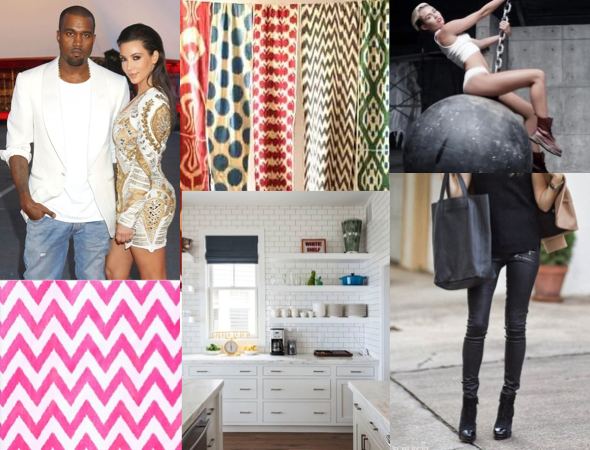 Leave..chevron, oil rubbed bronze(maybe it's just a Nashville problem), twerking, Kanye West. Hitha Palepu: Love smoking slippers, Jennifer Lawrence, and off the beaten path travel in 2014. Leaving skorts, the paleo diet, and the Kardashians in 2013. House of Pemberley: Love leopard, stripes, monograms and black and white. Leave burlap, distressing and birds. Jenny Tucker: In 2014 I'm loving gray, gray, and more gray, high heels with bows on the toe, and great books adapted to the big screen ie: Gone Girl. I'm leaving bronze hardware, leather leggings and Miley Cyrus in 2013. West 23rd Vintage: Love...intentionally collected and curated spaces that mix high/low, old/new, modern/traditional - and that incorporate vintage and personal artifacts... block print textiles and kantha quilts ... malachite and amethyst ... vintage barware...abstract art and watercolors...burled wood...overdyed rugs. Leave ... Justin Beiber, wall decals and decorating for resale. Decorate for the way you want to live and not for some future buyer! ellivenstudio: Love: black window frames, grid print, sisal, agate, incorporating vintage pieces, mixing pieces and loving dark walls & lacquer. Leave: rooms without personality. Susie Bettenhausen: Well personally...I would LEAVE beige walls, stainless appliances, granite, chevron, ikat, quatrefoil, upholstered headboards, moroccan poufs, black electronics, starburst mirrors, vinyl wall decals and Facebook. I would be LOVING sleek, modern, and minimal furniture mixed with vintage pieces, bold bright oversized minimalist art and accessories, framed maps, bright jeans, mixed metals, navy and blues. At least that's the top few! happypair11: Love in 2014 - recipes and entertaining from beautifully photographed cookbooks; discovering well written pieces from independent magazines; revisiting classic movies with your love; buying hand crafted high quality finds for home an friends; clogs; more travel! Leave in 2013 - leather jeans, cut off shorts, midriff bearing or cut out tops, Miley Cyrus. Laura O'Neill: LOVE: dark floors, white walls, super oversized art. LEAVE: open shelving in the kitchen. Reality check, it looks messy and dishes get dusty. SouthernDistinctions: Loving hand blocked fabrics, vintage Turkish rugs and brass for 2014. SO over chevron fabrics ( let's transfer it to wood floors), white upholstered furniture (beautiful, but short lived in real life) and chunky heels. They can stay in 2013. FalmouthGirl: I'm sure I will be in the minority here but I'm hating Radiant Orchid. Pantone's Color of the Year. Leaving it already! Loving indigo, and will never stop loving grey and white in any form, texture or pattern. Leaving the Kardashians and hope they take all the Radiant Orchid paint, material and whatever else with them! elhubs: I think it's time for me to leave chevron behind. Always love Greek key trim, malachite, leopard and hand printed Indian fabrics. Will always love seagrass. Loving dark wood floors and strie walls. Over monogrammed rooms can stay in 2013 in my opinion. domesticate: I'm loving that everyone else is loving hand blocked prints. Me too! (Especially since my new fabric line will be all hand blocked and painted) I feel the pendulum is still swinging towards smaller run, handmade items. Marianne Strong: Loving: Natural materials, soft neutral stains, rich color and pattern, anything navy, oversized art, materials that naturally patina, off beat touches that reflect your personality without being over the top, shopping local. Leaving: cheap knockoffs without character and all white everything- pretty in pictures but leaves me wanting more in person. What are your thoughts? Do you agree with our picks? What will you love in 2014 and what do you want to leave behind in 2013? Hi! I agree with you. And I would really love to leave the blue high waist jeans shorts, in combination with white converse. It has been the number one thing to wear in summer for the last 2 (3?) years now, and I think someone should come up with a new every-summer-outfit. Have a stylish 2014 ! Couldn't agree more with your picks! Thanks so much for the inclusion & happy new year! Great post! Thanks for including me! Happy New Year!!! Love it! Couldn't agree more. Thank you so much for including me !!! I really enjoyed everyone's thoughts on this! Thanks for including me. You hit the nail on the head with what should be left behind! Couldn't agree more with Kim, Miley, radiant orchid, and industrial design. As an artist, I would love to see the public learn to distinguish between quality timeless art and fads that truly aren't worth spending money on. Great list, thanks for kicking my year off on a positive note by including me in this! Thanks for sharing your thoughts, guys! It sounds like we are all on a similar wavelength. Thanks for including me, Paloma! Love hearing what you and others predict will gain popularity, sustain momentum and what will (or should) fall by the wayside in 2014. Those were funny. Leopard might be too hot right now. I just put leopard carpet up my stairs and into the landing... if it's the new chevron I have made a horrible mistake. Today I love it!